Visitors to the Panama-Pacific International Exposition could not help but be awestruck by the monumental scale of the buildings. 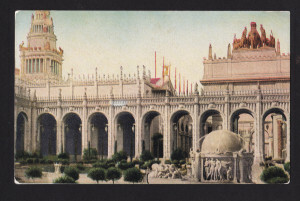 It was a Fair of Superlatives: the grounds covered 635 acres, the Palace of Horticulture was the largest dome then in existence (larger than St. Peter’s in Rome), the Tower of Jewels rose 435 feet high–forty-three stories! 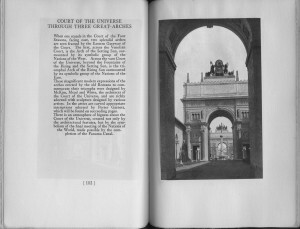 The Architecture and Landscape Gardening of the Exposition (1915), the third in the quartet of Paul Elder’s survey of the PPIE, is a photographic survey of the buildings and gardens. 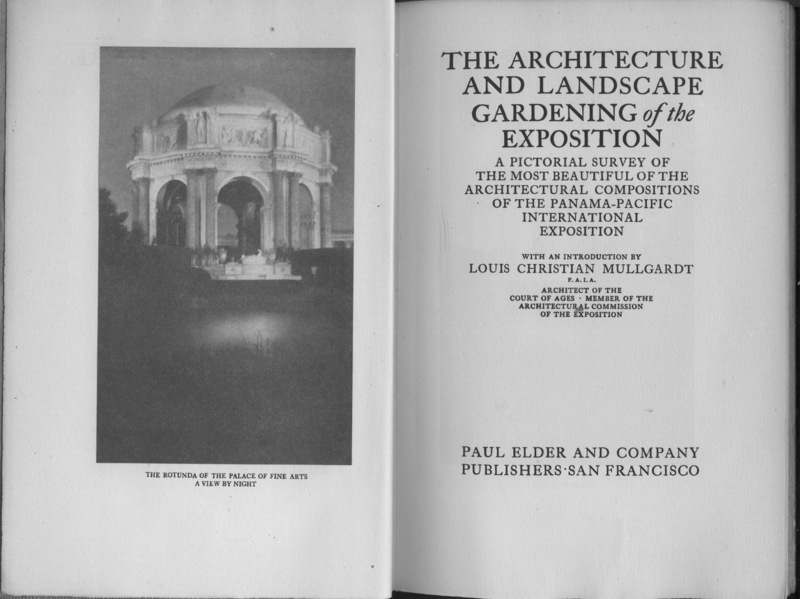 Louis Christian Mullgardt (1866-1942) was an American architect associated with the San Francisco Bay Area’s Arts & Crafts period, often called the First Bay Tradition. 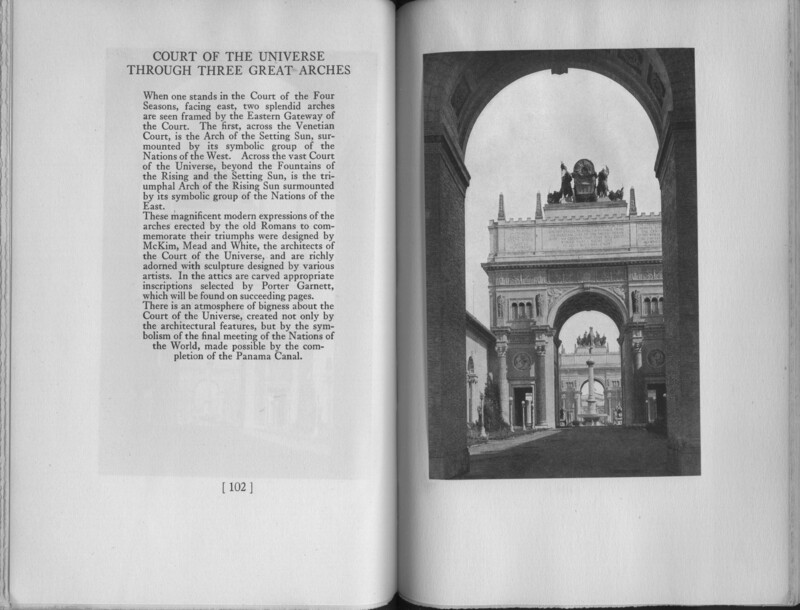 He designed the Court of the Ages at the PPIE, and lobbied hard to save the Fair after it was over. 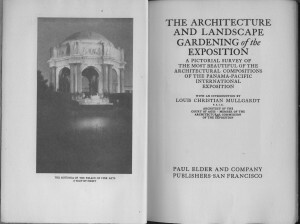 He told the Commonwealth Club that “when the Exposition buildings are torn down, then we will have destroyed one of the greatest architectural units which has ever been created in the history of the world.” Based partly on his work at the Fair, he was chosen to design the De Young Museum in Golden Gate Park. Mullgardt is listed as the author, though his content is limited to the dedication, and a half-page “reflection” and a ten-page introduction. 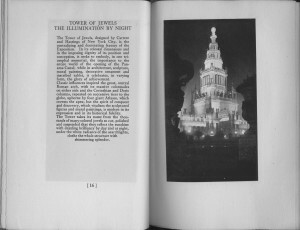 The bulk of the book consists of 95 tipped-in photographs with descriptive texts by Maud Raymond and John Hamlin, who are credited only in the colophon. Maud Mary Wotring was born in Ohio in 1867. She graduated from Hastings College in Hastings, Nebraska in 1890 and taught Greek and Latin at Longmont, Colorado. In 1895 she married Paul Raymond. 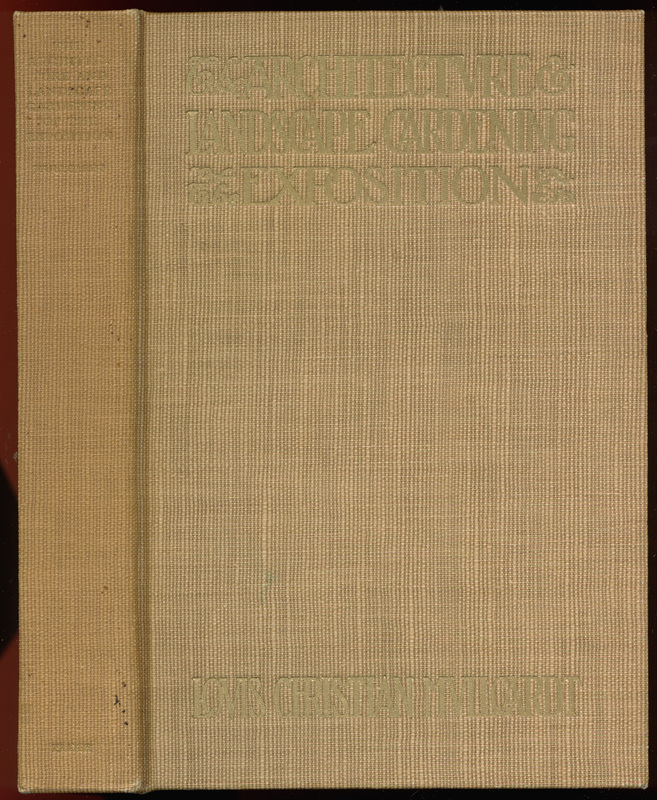 She was active in Christian missionary work, and in 1913 published The King’s Business: A Study of Increased Efficiency for Women’s Missionary Societies. 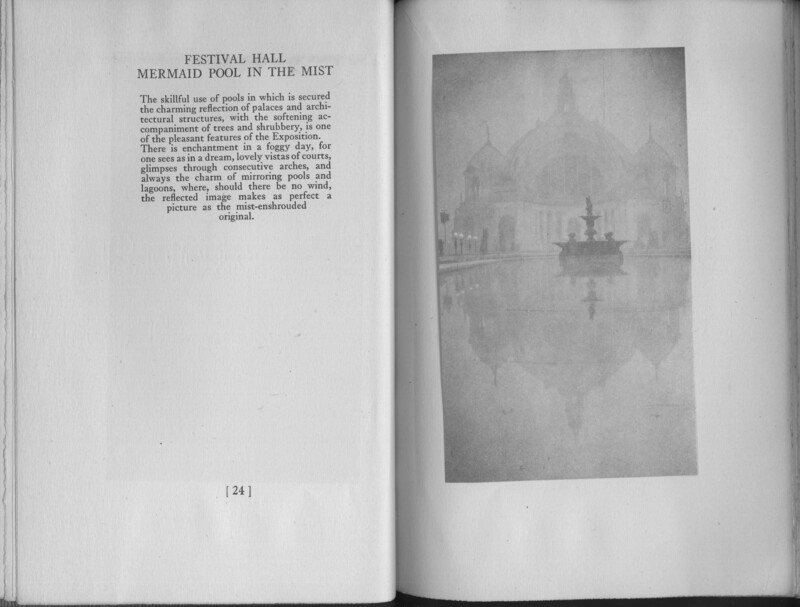 In 1928 she was still living in San Francisco. 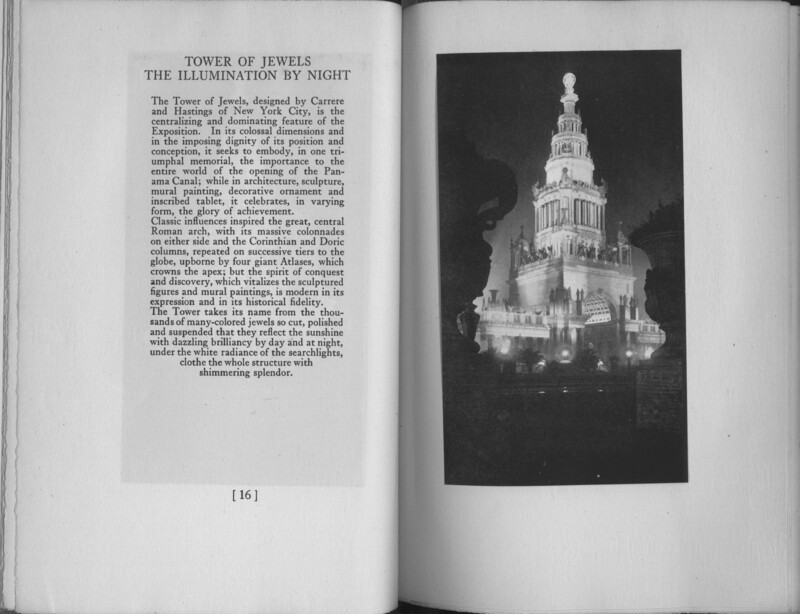 John Harold Hamlin (1880-1951) was an author active from the 1920s into the 1940s. 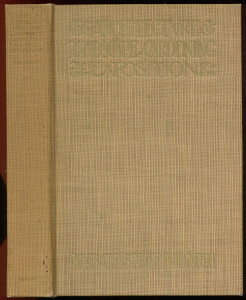 He wrote fiction, usually with a Western theme, for both juveniles and adults.